In this sign I'm keeping my thumb on my head, but I don't have to. I could start the sign an inch or two out from my head and as I bend my index and middle finger I could bring the thumb down to the head and repeat. Either way is fine. Sample sentence: "Are you mischievous sometimes?" The sign mischievous is a version of the sign for "devil." The sign "DEVIL" uses a serious expression with a set jaw and penetrating gaze. The sign "mischievous" uses a mischievous facial expression: an exaggerated smile, you duck the head forward a bit, hunch the shoulders up a bit, and squint the eyes somewhat. I remember watching a Hearing person sign a prayer at church. He asked the Lord for protection from "horse." Heh. I knew what he meant of course, but I also knew that he didn't know the difference between the sign for "Devil" and the sign for "horse." The sign "HORSE" uses an "H or U" hand with the thumb extended, and the fingers together. The fingers bend at the first (large) knuckles. 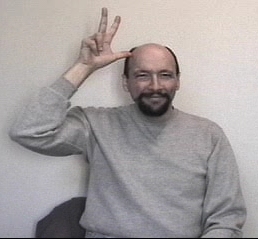 The sign for "devil" (or "Satan") uses a "three hand" and bends, unbends, and re-bends the fingers at the second and third knuckles (the small knuckles) ending in a 3 digit claw shape with the thumb touching the side of the forehead.